I so appreciate the response to these cookbook giveaways. While I’m not a fan of all giveaways, I know that cookbooks inspire folks the most so I absolutely love giving them away. The cookbooks I share always fit my gfe approach and so often they are written by folks whom I know personally. In many cases, I’ve even sampled the author’s recipes that they actually cooked themselves. I think that’s very cool. I truly wish I could give away a cookbook to each person who enters. 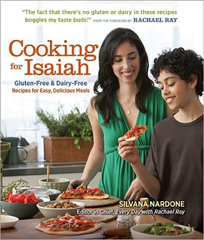 There are so many dedicated fans of Silvana and her gluten-free, dairy-free cookbook, Cooking for Isaiah. All entering the giveaway left their reviews in comments on the original post. There are even more who are eager to try her family-friendly recipes for the first time. The winners and their comments are shown below. One copy is compliments of Silvana Nardone and her publisher, Readers Digest. The other two copies are compliments of gfe. Only one winner just didn’t seem fair; congrats to all! Per usual, the winners were selected via random.org. If you didn’t win this time, I still have a backlog of cookbooks to review and give away, so please subscribe to gfe via email or reader so you don’t miss any! Note: If you would like to purchase Silvana’s cookbook, the price is very reasonable on Amazon. Cindy—I am also a subscriber to your blog via email. Stephanie (No Grain, No Pain)—Also subscribed to your blog. P.S. I love that you made this “accidental” recipe work. Charis (Gifts of Grace)—I’d love read and win this book! I will contact the winners by email. If I don’t hear back from them by Friday, I will choose new winners. (I hate it when that happens.) So if you’re a winner, please check your email and reply promptly! I am very excited to win a copy of the book! Thank you so much. I was diagnosis with celiac 2 1/2 years ago and it has been a huge lifestyle change for me. I also teach preschoolers and we bake once a week so I’m sure I’ll be using it with my classes as well. Cindy–I love excited winners! 🙂 But more importantly, I’m tickled pink that you will be using Silvana’s cookbook to work with your preschoolers! Going gluten free is a huge lifestyle change for most everyone, but bravo my dear on your success. Each of us needs a big pat on the back for making the transition! thank you so much! I can’t wait to try it! Thanks so much Shirley! I am stoked to try out some of the recipes in this book!! Congrats to the winners and I so agree with you – cookbooks inspire others and at the end of the day isn’t that what our blogs are all about? I know this, YOU inspire ME! I’m so lucky to have you as one of my cheerleaders, dear–thanks! Every time I check out one of your recipes, I ooh and ahh and think I want to make food like Carol. 😉 True!